AddressThe address for this sale in Falls Church, VA 22046 will no longer be shown since it has already ended. Terms & Conditions - Cash or local check accepted. Dealers- Please bring your tax ID/resale numbers. If you are buying furniture, please bring your own help for moving. Restroom facilities will not be available. PICTURE DISCLAIMER: Pictures of the items we expect to sell at the estate sale are posted approximately a week before the family reviews the sale. There are times when family will ask us at the last minute to pull an item. PLEASE NOTE - details of a particular item, including measurements, condition and/or price cannot be given out in advance. 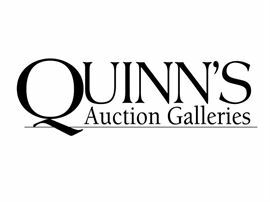 Quinn's Auction Galleries Weekly Treasure Auctions offer a variety of items including art, furniture, collectibles and more. Bidding usually starts at $10. Visit our gallery at 360 South Washington Street, Falls Church Tuesday 4pm-7pm and Wednesday 10am-6pm to preview this week's items or visit our website at www.quinnsauction.com to view the catalog online.